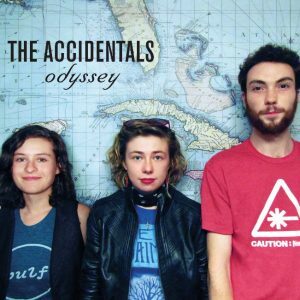 With ODYSSEY, the extraordinary Sony Masterworks debut album from The Accidentals, the group hopes to affirm their place among contemporary music’s most original and adventurous new bands. Multi-instrumentalists Sav Buist and Katie Larson – joined on stage and in the studio by drummer Michael Dause – have crafted a genre all their own, fueled by their uniquely limitless approach to musicality and songcraft. As its title suggests, ODYSSEY is built upon the foundation of real life experience through adversity and finding strength in vulnerability, their five-year journey having brought them to this cusp moment. Lyrically powerful songs like “Earthbound” and the potent title track see the band embracing their choice to lead an unconventional life with all its many surprising twists and turns. Now, at long last, The Accidentals unveil their most compelling and finely honed work to date. Co-produced by Buist, Larson, and Dause with engineer Jason Lehning (Mat Kearney, Guster, George Jones, Alison Krauss) at Asheville, NC’s Echo Mountain Recording, ODYSSEY sees the band joined by such friends and fans as acoustic guitar maestra Kaki King, bassist – and fellow Michigander – Dominic John Davis (Jack White, Beck), Carbon Leaf guitarist Carter Gravatt, Keller Williams and The Decemberists’ Jenny Conlee, who spent three days in the studio alongside the band, lending her distinctive organ to a number of the album’s key tracks. Multi-talented guitarist/keyboardist Jake Allen will join The Accidentals on stage as a special guest, filling in some of the colors and textures of ODYSSEY in live performances. The goal as ever is to experiment and experience, exploring new ideas and approaches while always staying true to their roots. With ODYSSEY, The Accidentals have conjured a truly one of its kind sound and vision, booming with free-thinking musicality, wisdom, and an understanding that growth is a process, not something that happens overnight. The Accidentals are already moving forward on their amazing journey, rolling down the windows on an open road towards someplace that’s both true and transcendent. Sav: We are currently in Huntington Beach, CA! We’re all kind of split up – we had a day off, so some of us went shopping; others went to the beach…for the most part, Katie and I just ate a lot of good food (as we typically try to do). I’m the kind of person who has to have music playing in the background of 99.9% of my life, and right now I’m jamming to a playlist of Queen, Radiohead, Led Zeppelin, Kaki King, Vulfpeck, Gabriel Kahane, St. Vincent, Andrew Bird and more. I love music that features technical proficiency, but I also crave lyrical content that brings forth saturated imagery – it’s most relaxing for me when I can analyze every piece of a song and find something new in hearing it every time…which is how I end up obsessing over the same artists for months. Haha. Katie: Generally you can find us in the van plugged into our respective headphones..listening to podcasts, music..etc. I usually have a hard time splitting my focus between music and writing, but sometimes our environment gets chaotic and music helps me tune everything else out. When I’m working I might listen to The Books, STFKR, The Roots, maybe some Bossa Nova tunes. Michael: I have really been getting into the new album from The National. It’s a good album for the long night drives in the van. I think I listened back to their whole discography on the drive from Austin to Phoenix. Sav: It’s already been an interesting year! We signed with Sony Masterworks on the tail end of 2016, and we put out a new album called Odyssey, which is all about moving forward boldly – not in the absence of fear, but in spite of it. It’s the culmination of six years of being a band, and the ups and downs that come with living life in a van and out of a suitcase. We also started off the year upgrading all of our equipment. We’re sponsored by Shure, Takamine, Fender, D’Addario, and Boss/Roland, who have helped us acquire mics, in-ear monitor systems, acoustic and electric guitars, amplifiers, pedals, and strings. As a result, we’ve really been able to hone our craft, embrace our audiophile nerdiness, and execute our music the way it was meant to sound. Katie: 2016 was a tumultuous year, we started it by moving on from a production deal and independently recording and releasing an EP, touring 230 shows, signing a label deal, and recording and mixing a full length album, through periods of global political shifts and lost musical heroes. It was easy to feel exhausted and daunted as 2017 started. We felt like we’d just climbed a mountain, and the truth is that once you finish an album the work really begins. We really had to dig in deep and use our strength to push forward, and we are really thankful for our team who has been helping us with the marketing, distribution, booking, press..now we’re able to share our music worldwide and we’re making more time to be present and enjoy the ride. Sav: Katie and I met in our public high school philharmonic orchestra! We were in a classical quartet together, and we also covered Led Zeppelin songs in an after-school club called the Alternative Styles club. We were the only two people in our class to volunteer to play at a music booster’s meeting, so Katie came over to my house to rehearse, and we got side-tracked playing the White Stripes instead. Luckily for us, my mom actually documented the first time we ever played together with her iPhone and put it on Facebook, so every September 21st, it pops up in our memory feed. Something about the name we chose really seemed to click with every aspect of who we are. An accidental in music theory is a note that doesn’t quite fit in the key signature, but still makes sense. We are a bit genre-less, and we don’t quite fit – but we like to think that our music has a life of its own and makes sense. We also are incredibly accident-prone, and we find that most of the “accidents” we get into lead to things that we didn’t even know were “meant to be” – much like how we met in the first place. Katie: Sav and I both have different personalities and musical strengths. Naturally, I love holding down rhythm and creating a harmonic landscape, and Sav has an ear for vocal harmonies and improving solos. The first time we sang together it felt way too easy, at the time I don’t think I realized how lucky we were. We really compliment each other, and after playing together for 6 years we’ve helped each other grow and balance our strengths and weaknesses. It was a slow realization that we could do this for a career…we had devoted ourselves to the project full time, but it wasn’t until after high school that things started taking off. I always like to ask artists how their hometown has been an influence on the kind of music they make and really what kind of a band they are today. So how do you think your hometown of Traverse City, MI has affected you all and the music that you create? Sav: We were lucky enough to grow up in a community that is incredibly supportive of the arts. Our schools have music programs that allow kids to try out and choose an instrument to play around fifth grade, which is how Katie and I got started on cello and violin at an early age and our public high school encouraged alternative strings and allotted a budget for odd instruments. There’s also a thriving local music scene. We got our start playing coffee houses and breweries (even though we were only teenagers), and eventually we started delving into the session world as a string team, arranging parts and playing on local artist’s albums. Many local musicians took us under their wing and gave us pieces of knowledge or genre that inspired us to keep exploring. There’s always a collaborative nature, one that we try to carry with us along the road. Katie: Traverse City, and our network of family and friends, really made us feel supported. There is such a huge music loving community there that I don’t think we felt pressured to stick to a certain style of music, and that freedom led us to exploring all genres and mashing a few together. Let’s talk about your recently released debut album, “Odyssey.” What does it feel like to finally have it out into the world? What was it like putting this collection together? Did anything surprise you about the overall process? How long did it take to create it? Sav: Odyssey is the perfect name for this album because recording it was an odyssey all by itself. Some of the songs on it are ones we’ve played thousands of times, but were unable to release during our time in a production deal. Other songs are so new, we’ve barely scratched their surfaces. The process of picking and choosing from the numerous amounts of unrecorded songs we wrote between 2013 and now was incredibly difficult, but we chose songs that represented the six-year journey thus far. Some of the songs are about being present and not taking things for granted (but not beating yourself up when you do, because nobody’s perfect). Others are about learning not to fear change. Most of them are about the strength in vulnerability, and how important it is to be authentic and open with one another. In the end, we were surprised that the album had flow and consistency, since there are so many different genres and facets on it – but in recording, we learned to let each song breathe on its own, and found a balance between intentional and organic. Kate: We started tracking last October, at a studio called Echo Mountain in Asheville, NC. Our goal was to capture some of the energy from our live show, and find a balance between creating huge arrangements and keeping it “live feel”. We did most of the basic tracks in 2 weeks, then after finishing the recording and doing overdubs in Nashville, we started the mixing process. Mixing took the most time, we ended up spending around 3 months working with engineers to get to a mix and master that best represented the music. It was a really intense process, but we came away with more knowledge about frequencies, arrangement, and trusting our ear. Can you describe what it was like writing the songs “Memorial Day” and “KW”? What was the inspiration for them? Generally, how do you all go about putting songs together? Sav: Those are the perfect two songs to choose, since each of us wrote one! Katie and I tend to write separately 99% of the time. The writing is therapeutic for us. It helps us process the road (and life in general) in a way that allows for self-expression and kind of “unclutters” everything. The arrangements, however, involve all three of us – Katie, our drummer Michael, and me. Katie or I will bring a song to the table and each of us will add pieces to it – “awe moments” as well call them – until the song is ready. KW actually stands for Keller Williams, a funk/reggae/blues/jamband guitarist and excellent human being we toured with extensively across the US. I was really inspired by his style of playing, and I wanted to incorporate some of it into a song. I’d been playing with the opening riff for about three years, which is rare for me, because I usually knock out a song in about two hours – but the riff didn’t fit anywhere until I heard Keller play. It was only then that I knew what to do with it. As far as the lyrics are concerned, it’s kind of an anti-bullying anthem. I’ve been bullied in the past, and sometimes past bullies will come to shows and pretend nothing ever happened. I’m not the kind of person who holds grudges, and I’m willing to forgive a lot of things – but refusing to even acknowledge an abusive history is something that’s always bugged me. If you want a fresh start, you first have to give people closure. Katie: I wrote Memorial Day during the summer after my junior year of high school. Sav and I were doing our first mini tour with 2 friends of ours from Michigan, I had recently ended one long distance relationship and started another one, and one of my friends who I greatly looked up to passed away unexpectedly. Needless to say I was unsure about what the future would hold, and I’m already the type of personality who worries about things really far in advance. Our lives were so busy and I felt like things were happening so fast, we had moved past what we could control, so on the end refrain of the song, the lyrics “now it’s gone” refer to the moments we let go of in order to move on. How was your tour this summer? What were some favorite venues and/or crowds? What do you think makes for a perfect show for The Accidentals? Sav: The tour this summer was great! We played a ton of festivals (we absolutely love festivals), ate great food and met incredible people, and we made friends with a ton of musicians along the way. I have to say, though, it had its own accidents…we started out calling the summer tour the “NO FEAR” tour, but we ended up calling it the “NO GEAR” tour after we were hit by a tornado halfway through our festival set in Madison, IN. We were then hit by 12 consecutive thunderstorms along the rest of the tour. It was a little out-of-hand for a while, but luckily we’re back up to speed. This week we lost the transmission in the van so now we are calling it the NO GEARS tour. It’s hard to say what a perfect show is for us – we have a couple of different types of shows, depending on where we’re at. Sometimes we tell stories, and other times we just rock out. I like the spontaneity of being able to get to a venue and figure out what an audience might be feeling; then writing a setlist to kind of accommodate that. Katie: We did our first mini tour in Canada! We played a music fest there and ended up pulling off two entire improvised sets with a funk band and a folk band we met there for the first time. It was exciting. I don’t think there is a perfect show for us, we’re perfectionists so it’s tempting to try and control every element, but when we step back and something challenges us it makes for a much more interesting experience for everyone involved. Michael: We had the chance to play some amazing festivals this summer. One of the best feelings is when you go to a new festival and get to connect with the people from that region. I don’t know if there is a recipe for a perfect show, but getting in tune with a new crowd of people is an amazing experience, especially when we get to talk and mingle with the festival-goers after a performance. Sav: It’s hard to say. I like having time to do each of those things. One of my favorite things to do is “nest” – basically bringing all of my favorite things to a little corner and creating a Sav habitat. Being in a studio really allows me to put that into action. Sometimes I’ll fill up a recording booth with blankets and teacups and instruments and make it a comfort zone. Other times, I like being on the road because it challenges me to stay healthy. I’m a patternized kind of person, so I like building day-to-day routines to establish consistency in a life where you find yourself in a different city every night. I find myself drinking more water, eating healthier, and exercising on the road as a result. I guess it just depends on what kind of headspace I’m in – but I think I’ve learned to love and find value in all of it. Katie: I feel most fulfilled by having a variety of experiences. I didn’t do much traveling until we started touring, so seeing new places usually blows my mind. Some of my happiest moments have been on the back of a golf cart zooming around a music festival, eating amazing food, checking out art museums, getting tours of instrument factories, meeting interesting people and their pets, playing with orchestras, touring with our favorite artists. Of course, after a few months of touring all I want is to experience my bed, some pizza, Netflix, and my family and friends. Michael: Being on stage and recording in a studio are different kinds of happiness. The rush of adrenaline that comes with performing is wonderful, and something that does not often come around in the studio. However, recording allows you to explore all the options in front of you without having to worry about eliciting an immediate response. You can sit with your ideas and build them, which to me is sometimes just as exciting as kicking into a groove on stage. With the summer over now, what was your favorite part about it? What was something fun that this group did or tried? Sav: I keep a journal of everything we do each day on the road, which is good, because time really flies by fast when you travel. Our tour manager, Amber, is really good at finding things to do on our days off. In Toronto, we went to the CN Tower; in Pagosa Springs, we tried the sulfur hot springs – the list goes on and on. The festivals are also partial vacations for us – once we’re done playing, we can walk around and eat great food, watch other musical acts, and look at all the cool local art. Katie: We ate poutine for the first time. We saw a manatee while kayaking at a fest in Florida. We helped create an “Accidentals” ice cream flavor for Moomer’s Ice Cream. We put out “Odyssey”! Michael: This summer marked the bands (and my own) first trip to Canada for a run of shows. We made some wonderful new friends and had musical experiences that I will never forget. At one festival in Ontario, we played an improvised set with a funk band. The drummer of the other group and I would switch off between drum kit and aux percussion every other song. I was drenched in sweat from the first song and loved every second of it. Sav: I think writing music is our way of being able to speak truthfully. Everyone in the band is an introvert, which makes this lifestyle counter-intuitive – it involves a lot of socializing, a lot of change and inconsistency, a lot of sharing every part of yourself. It’s a ton to process. When we perform, we kind of break down the barrier and use our music as a vehicle for truth. I try to write in a way that is narrative and connective, because I enjoy music that points out something I may have noticed but haven’t thought much about. The joy for me comes in the healing process that music provides. There’s something really intimate about it. It’s a way of banding together in a rough, divided world. I think the path of authenticity is being paved all around us, and I think music and art will continue to call out to change and remind us of universal truths. Often, it is music that is the authentic history of a time/movement. Katie: A few days ago we did a workshop with the high schoolers at Flagstaff High School in Arizona and it really made my day. When I was in high school I didn’t think I could improvise and I felt held back by my social anxiety. Seeing students get comfortable jamming with us or talking to us really gives me hope. I think that music is a tool like any other art form. Everyone is going through their own struggle, and music finds a way to reflect that. Sav: I love songwriters like Neko Case and Gabriel Kahane, people who use history, powerful imagery, and narrative to bring something to light. I also love technical geniuses like Kaki King, Andy McKee, Victor Wooten, Chris Thile, Ben Folds, and Andrew Bird. We’ve already had a ton of dream collaborations – Odyssey features guest artists like Jenny Conlee (The Decemberists), Kaki King, Keller Williams, Dominic Davis (bass player for Jack White), and Carter Gravatt (Carbon Leaf). However, I think a mutual dream for Katie and me is to one day have a horn section or even a full orchestra behind us. Michael: Vulfpeck has a new album coming out in about a month, and I think I can safely say that we are all anxious to hear it. We sometimes jam on their tunes during sound check or play their songs before a show to get pumped up. It would be so much fun to jam with those guys. Sav: I hope that people take away the idea that being afraid, being young, asking questions, being vulnerable – it doesn’t make you weak. True strength lies in being open with one another, in being honest with yourself and others. It’s so much easier said than done, and that’s why you have to keep moving forward – even if it’s just baby steps. That’s what it means to #odysseyboldly. Katie: Our goal is to be authentic with our music, and hopefully that inspires other people. Sav: I’m only speaking from our experience, but what worked for us was to really embrace our local music scene – playing every gig we could, meeting all the local musicians and asking for advice. We are also workaholics, and being business owners and performers in the music industry takes a lot of work – but if you’re willing to work hard, ask questions, and bring professionalism to your environment, you can change the story. Katie: My advice is to ask for what you need. Sav and I pride ourselves on being self-sufficient, but if I hadn’t been open to working with other people or asking for help, we wouldn’t be where we are today. Michael: Stay positive and passionate. If you love what you’re doing, don’t let someone else tell you that can’t. Erase that word from your dictionary and keep testing your ideas. It’s not a super easy thing to always keep in mind (I know I have trouble feeling super confident 100% of the time), but attempting something is always better than never having tried. Sav: We tour 200+ dates a year and we are almost surely headed your way so please let your friends know we are coming! Our whole schedule is at www.theaccidentalsmusic.com. Our music is available on iTunes and Spotify as well as Barnes and Noble (which is awesome because we’re total book-lovers). You can find out more about us at www.theaccidentalsmusic.com! Michael Come see us on the road! We are in the midst of a 70 day tour across the US (and 1 show in Canada). We promise to take a goofy photo with you if you come say hi. An Interview With The Rockers, BREAKING SOLACE!